The Smokehouse at House of Blues is one of my absolute favorite little Quick-Service stands in Disney Springs. The turkey legs and cheap, cold beer have brought me back time and time again over the years!! I love all the unique little eatery stands inside Disney Springs and I’m tackling the tastiness one-by-one on each of my trips! This is the third article in a series of Disney Springs Dining favorites of mine so be sure to subscribe below to get these and many more restaurants and shop reviews from Disney Springs! 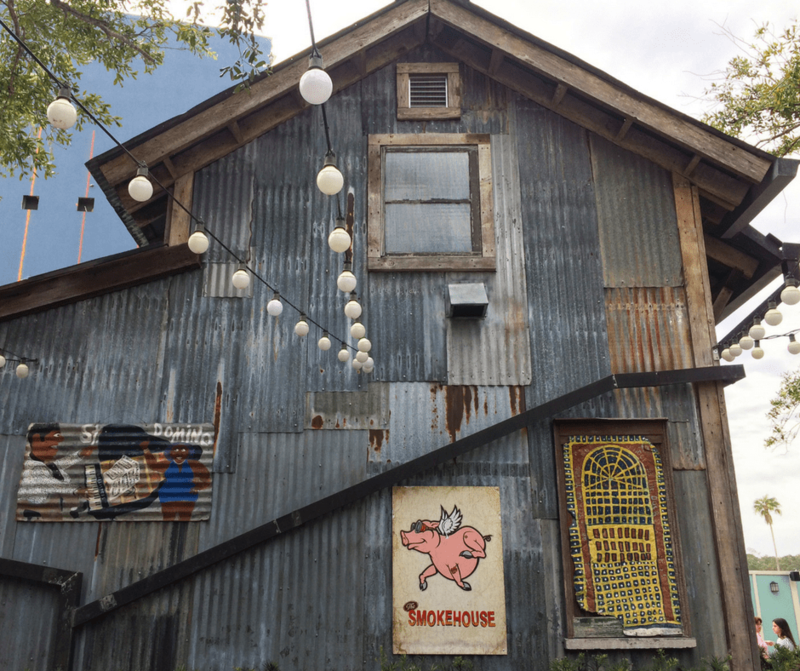 The Smokehouse was actually the very first place we ate at back in 2016 after the revamp from Downtown Disney to Disney Springs and for us, it was quick and smelled ridiculously good. We had flown in that day and arrived at Disney Springs starving, like a cartoon mouse to cheese, we were guided by the smell of bbq to the Smokehouse. Our first meal was Half Rack of Ribs for $13.99 that my mom and I were able to split. It came with Chips and Baked Beans at the time, but now it just comes with coleslaw. They will let you exchange the coleslaw for another side if you’re not a slaw person. the best being at Yak and Yeti in Disney’s Animal Kingdom. People will give the Turkey Legs a hard time but they are definitely one of my favorite things to eat on a Disney Trip!! I’ve made points to go by the Smokehouse as we leave Orlando to take a Turkey Leg home with me!! We had arrived just in time for Happy Hour and this was how we found out about the cheapest, coldest beer at Disney Springs! During Happy Hour the Budlight and Michelob Ultra are $3.75! Even regular they’re only $6 which is a lot cheaper than most places selling beer in Disney Springs. On our Memorial Day trip to Disney World, we stopped by the Smokehouse just for Happy Hour and the live music. The outdoor sitting area at the Smokehouse has a really relaxing vibe to it. We’ve really enjoyed sitting, drinking cold beer and listening to the front porch live music playing. Watch out for the Disney wildlife though!! They love Smokehouse food as much as I do!! Pulled Pork or Pulled Chicken Sandwich for $11.99. Smokehouse Nachos for $9.99 or $11.99 if you add Pulled Pork/Chicken or Brisket. Smoked Beef Brisket Sandwich for $12.99. Assorted Fountain Beverages are available as well as a Beer and Wine selection. Kids Meals include an All Beef Hotdog and a Mini Pulled Pork Slider. Also, be sure to stop by the Gear Shop at House of Blues!! and amazing home decor, collectibles, and hot sauces to take back home!! What do you guys think of The Smokehouse at House of Blues?? If you’ve tried it let me know what you thought in the comments! !